It’s time for the countryside to explode in frothy blossom. 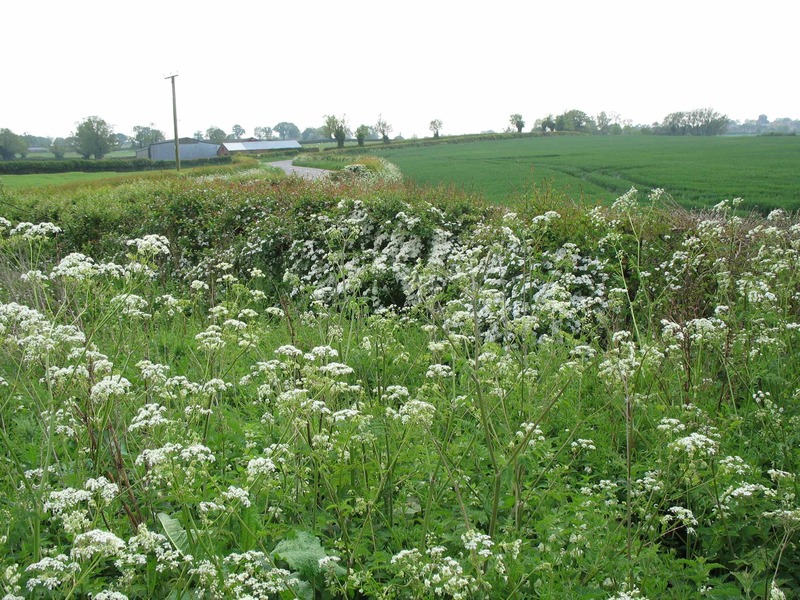 The Northamptonshire hedgerows are decked out like a wedding cake in creamy white hawthorn blossom, with masses of cow parsley flowering below it. The artist David Hockney called this short period of time ‘action week’, as everything seemed to come out at once after the long winter and gradual greening of the landscape in the spring. It was also ‘action week’ for him, painting frantically to capture the moment. For gardeners, this time is also one for much activity, as along with the sudden growth of garden flowers come the weeds. Annuals are easy to lift out; perennials need more care to stop deep roots snapping and lurking in the soil. I have finally succumbed to glyphosate for the brambles that never seem to stop growing, and am trying a form that you glue to the leaves individually. Now is the time to use it on the persistent weeds, as it works best when the plant is using up a lot of energy on growth. Now is also the time for the Chelsea Flower Show. This year, large slabs of recreated countryside are fashionable, especially woodland. I can see why – I love that naturalistic style, and it’s what is out this time of year anyway. Substitute anthriscus ‘Ravenswing’ for our native cow parsley, geraniums for herb Robert and use foxgloves everywhere.. woodland is the new prairie! I do wonder, though, what you would do the rest of the year. In summer, as the tree canopy closes over, the woodland plants stop flowering until next spring. Beth Chatto’s garden has interesting woodland beds; she uses variegated and different colours of foliage to compensate for lack of flowers later on (see photo on left), so that is one way forward if you want a garden that is all woodland. She also gets the trees thinned out and takes out lower branches, so there are clearings and sunlit woodland edges in which to grow a wider range of plants. Another way, if you have the money, is to put in other features than plants eg streams, waterfalls and stone slabs, like Cleve West’s garden this year. Or you just leave it green, which can be very calming. The other Chelsea ‘imported landscape’ gardens are recreated moorland and desert, not very applicable to here at the moment (though Provence may be a hint of things to come). I was amused by Tim Richardson’s comment along the lines that if you had a garden like this year’s show gardens it wouldn’t be ‘come and see my garden’ but ‘come and see my imitation landscape’. The gardens are generally very beautiful and meticulously done, even if they can’t be easily transposed to a typical English plot. Thanks Jane,everywhere is so beautiful at this time of year. I love hawthorn blossom. I went to Chelsea this year,lots of foxgloves. So crowded I couldn’t reach all the explanation boards so not sure which designers gardens I saw,but all lovely. If I go again I’ll take my folding seat! Yes, I’d love to go to Chelsea again but it does seem very crowded from the TV coverage. There are many gardens there I’d have liked to see ‘in the flesh’, like Cleve West’s and Andy Sturgeon’s, also Sarah Eberle’s two. Thanks for the comment, it’s nice to get them.